Thanks for the update on the Chengdu-Chongqing Economic Zone, Sascha. Having been to several of the 3rd and 4th tier cities in Sichuan you mentioned (Suining, Mianyang, Nanchong, etc..) I’ve often wondered how the prosperity in the region’s two dominant cities (Chengdu and Chongqing) would trickle into these other cities as well. Adam Nathaniel Mayer - We have to wonder about that. As far as I can tell, the 1st tier cities (Beijing, Shanghai, Guangzhou, Shenzhen) and even 2nd tier cities (Chengdu, Chongqing, Wuhan, Hangzhou, Suzhou, Xi’an, Dalian, Shenyang, etc…) will be just fine heading into the future given that so many resources have gone into developing these places and also they are big enough as to not escape the radar of the Central Government (what has recently happened in Chongqing is a perfect example). As someone who works in the building industry in China, I am often asked why the quality of construction of most new buildings is so poor. The people who usually ask are expatriates from places like Europe or America; rarely does someone native to China who hasn’t spent time overseas pose the same question. 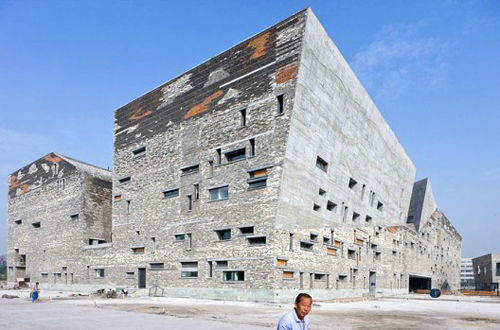 This perhaps has to do with the fact that building quality in China is relative. Most Chinese first-time home buyers moving into brand new housing tower blocks do not have the frame of reference to evaluate finish material quality. This is exacerbated by the fact most housing developers sell units as empty concrete shells, leaving it up to the owners to fit them out with finishes and fixtures. Warren - In the city I live in within China (which will remain nameless for my own protection), building is amazingly rampant and seemingly impossible to justify. Giant apartment complexes are turning up everywhere. In the last 3 years dozens of such mammoth projects have cropped up. Similarly, roads, tunnels, bridges and superhighways now crisscross a relatively small amount of land that one could largely encircle in a day on a mountain-bike. What is the purpose? I can only guess it’s “building for building’s sake.” Building appears to BE the economy, and it doesn’t matter if anyone every lives in the apartments or drives on the roads. Clearly, the infrastructure of the city couldn’t possibly handle the tens of thousands of people that the apartment complexes could house. There’s no room for the cars, and the streets aren’t wide enough to accommodate the traffic. I can’t see where all the new people would possibly work, either, except in construction (except that construction workers couldn’t afford to live in any of the fancy new apartments). Adam Nathaniel Mayer - Warren, the purpose of constructing new buildings and infrastructure in China is to modernize the country and improve the lives of its people. If you are from a Western nation, or one of the developed Asian countries such as Japan, South Korea or Singapore, then you cannot fault China for aspiring to join the ranks of developed countries- urban development is what they went through in the past and what China is going through currently. I tend to think that the problems associated with development in China are sometimes exaggerated out of proportion due to the fact that the country is huge, both in area and population. Also keep in mind that developed nations before also faced similar challenges when going through the same process. 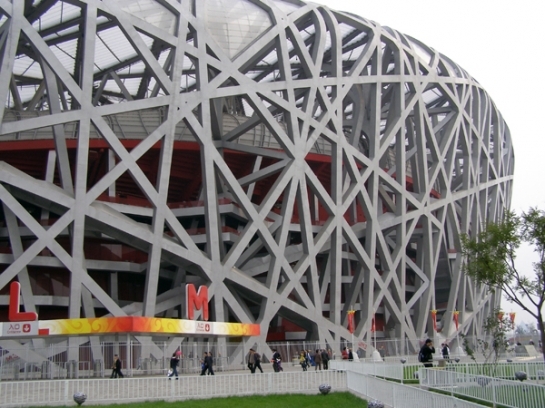 In this particular post, I chose to be critical of one aspect of development in China, particularly the flaws I see in construction industry processes. Yet I am actually fairly optimistic that these less than favorable practices will not go on forever. On the contrary, China is still learning and because of this, there are bound to be a few construction projects that turn out to be white elephants. That doesn’t mean that building new infrastructure and buildings is inherently wrong or evil. Unfortunately the mainstream media tends to distort reality by focusing again and again on the same handful of white elephants scattered across the country (New South China Mall in Dongguan, Zhengzhou New Area and Kangbashi New Area in Ordos). Yet, for every failed project, there are countless examples of success. For instance, Pudong in Shanghai, once derided as an out of control property bubble is today a vibrant financial and trade center. In Chengdu, even I thought that the new Hi-Tech Zone in the south of the city was a soulless collection of brand new office parks and wide boulevards when I first arrived. Now, 2 years later, the area is picking up and more and more businesses and government departments are relocating down there turning up the activity in the area. Warren - I would love to believe you are correct, Adam, and yet the development here not only rivals the Western counterparts, but far exceeds them. As I pointed out, development is largely equivalent to projects involving massive outpouring of cement, and little else that I can see. While there will be dozens of new mega-apartment complexes over 20 stories high, nearly every restaurant has no hot water in the restrooms. My own apartment, build in the last 3 years, also has no hot water in the kitchen or the bathroom sink. A good portion of the traffic lights in the city do not work, and there doesn’t appear any improvement in the infrastructure, including waste management, to accommodate ANY more people, let alone hundreds of thousands. According to my research the sewage plants could not handle the level of human wast 2 years ago. There’s “development” in terms of the GDP (gross domestic product), and then there’s the HDI (human development index). China is #2 for GDP but 89 for HDI. This development of cement may not ultimately result in a development of actual human lives. We can hope that “if we build it (out of cement), they will come and work here and owe all their money to their landlords,” but whether that is an ultimate good that can offset the associated costs of loss to health with the off-the-charts pollution is yet to be seen. Peter - Hey Adam, a interesting and insightful read. I’m thinking you are right that China is in the middle of change in urbanisation. It seems that you can almost draw parallels with the industrialisation in Europe in the 18oo’s and the rebuilding of world wars in the 20th century in the West. While most of those buildings were poorly built, it solved the immediate problem of housing. Then with time, it is possible to build better architecture. I remember that a decade or so ago the talk point is on the quality of the structure of buildings as developers cutting corners caused many buildings to collapse. By the sound of it, this ‘corner cutting’ acts of developers and contractors has come a long way since then (at least the structure will stand up).I agree to Warren’s point that the ultimate good at the moment is for the profit of a few. But I also think it is a stepping stone between finding enough places to house people to a living standard that people desires. I would venture to guess that when the boom slows down, building integrity should go up. Most developers most likely won’t start to care about quality until consumers demand it. Adam Nathaniel Mayer - Ingrid, sorry to hear about your experience with manufacturing gas pipes in China. Unfortunately, while it is shocking, this kind of experience is not too uncommon- especially when it comes to not honoring contracts. If a Chinese business does not anticipate a long-term relationship, they generally have no problem with pulling a fast one on a client (this not only happens to foreign customers, but within China as well). Recently I visited Zhujiang New Town, Guangzhou’s newly built central business district (CBD). While Guangzhou itself is hardly a new city (its status as an international trading port goes back centuries), the CBD is brand new, built on what used to be agricultural land well outside of the historic city core. 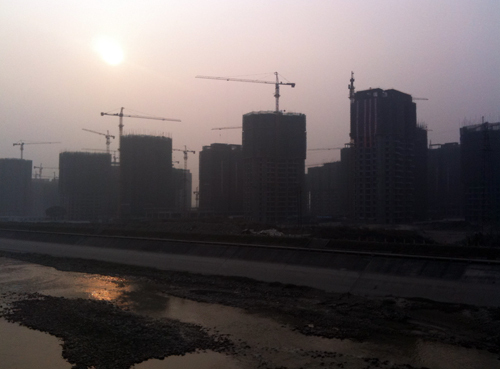 Though thanks to the city’s expanding underground metro and freeway system, Zhujiang New Town doesn’t seem so far away.